Today’s review comes from my fifteen-year-old son, Reese. The Rot & Ruin series is one of his favorites and he’s read it through twice – so far. When I saw this new graphic comic series, I knew he would love to read and review it. Compared to the Rot and Ruin series, this was an okay read. The concepts were good, but it was such a short book, the story felt rushed. I liked revisiting the characters again and thought the elements of the zombie babies and the ‘cows’ were innovative ideas. 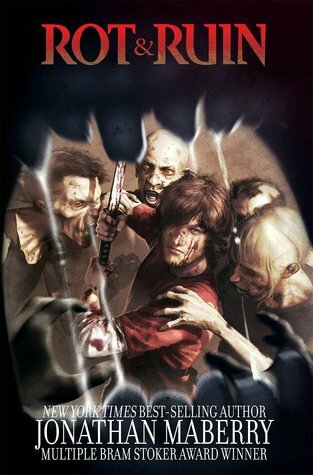 The art work was really good and similar to The Walking Dead graphic comics. I thought a few of the character details were off from the main series, like Lilah is supposed to have extremely white blonde hair, but in this book she had blonde hair. She also speaks softly because of a voice injury, but in this book she could yell over people. I would definitely read the next book in this series and would recommend it to my friends. Maybe you don’t have to have read all four books in the Rot & Ruin series before this one, but I’d recommend reading at least the first two books. Personally, I would prefer to have a series about Tom’s (my favorite character) adventures before Rot & Ruin. This book is scheduled for publication April 21, 2015. This review is based on a digital ARC from the publisher through NetGalley. Another one to add to my TBR!